Today is going to be short, because I am gathering up pics and activities for our 100th Day of School that we are celebrating this week!! SO stay tuned to see what fun I have planned for my little nuggets. I just really would like to take this time to share my "philosophy" of teaching...no worries, I will try not to bore you...I am just passionate about early childhood and I am saddened that it seems as though kindergarten isn't kindergarten any more, in most cases. But on the bright side, I am proud that my district still believes that kinders are little and they still need that play time to learn to socialize, solve problems, make friends, reenact real life situations.What is so wrong with 5 year olds BEING 5 year olds??? Why are we forcing them to grow up so quickly and turning them into "test taking little robots"? 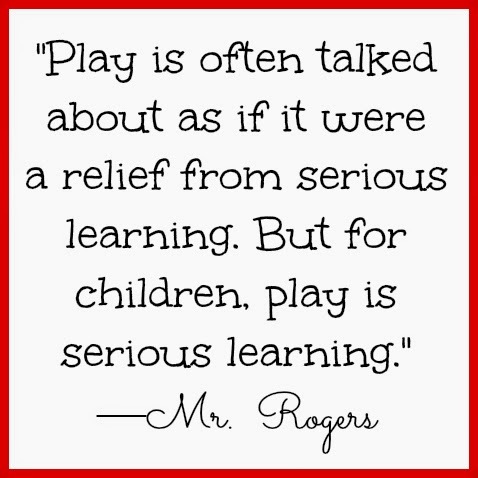 Now, don't get me wrong, I realize the value of test taking skills and when it is time to work in my class, it's time to work....but when it's time to play I pride myself on providing meaningful and engaging activities that they will enjoy and remember for years to come! I am happy to say that in my room I provide dramatic play, blocks, woodworking, sensory table, light table, ipad, computers, library, writing, and 5 different tables with fine motor activities each and every day for 45 minutes in the afternoon! This is what my kids look forward to the most! When they walk in on Monday mornings they always look in three places to see what we are studying that week, the dramatic play, sensory table and library. This excites them and gets them ready to learn! It makes me happy to see their faces light up when they walk into the room and there is an igloo and ice fishing, or a 50's diner, an apple stand, military command center, a Valentine chocolate shop, and so many others I'd love to list! I enjoy planning it and making it happen as much as they enjoy playing in it! So, it's ok if these little ones play each and every day! They are learning so much more through their free play with each other than I could ever teach them!! I love kindergarten , my kids love kindergarten and it's awesome that we are not your average kindergarten. This is my dramatic play for my penguin unit. The Emperor penguin on the wall is the actual size so the children can measure themselves to see if they are taller than an emperor or not. I also have "ice fishing" which is just an alphabet fishing game that is also used during literacy centers and there is a "fire" outside of their igloo. One of my favorite dramatic play centers to set up is my Christmas one!! they are able to redecorate the tree, make cookies, sip "cocoa" by the fire and you can't see but there is also a baby bed on the right side that they LOVE to play with! I put 2 babies in there because I only allow 2 people in this center because of space and it reduces the amount of quarrels and they seem to play better when there is just 2. Close up of cookie baking. I LOVE this Melissa and Doug sliced Christmas cookie set I found at TJ Maxx for $15!!! Woohoo!! I love a good bargain! I hope my post inspires you to let your little be just that...little. Love your centers, can you tell me where you got the fireplace? Graphics and Fonts Courtesy of: L. Paull Designs For All and KG Fonts.